And this is the card I made! I love using this stamp; it’s from Stampin’ Up’s “Very Thankful” set. I’ve used it on several different cards already. It goes well with the vintage-type papers. I made the roses out of Cameo Coral cardstock, because I don’t have any Groovy Guava on hand. I also substituted Old Olive for the Kiwi Kiss. I used Basic Black ink for the stamped image. The cardstock for the base is Bazzill. The patterned paper (and possibly the ribbon) is from Creative Imaginations. Gorgeous! Very elegant, love your velvet ribbon and roses! So pretty! The roses are just too cool! 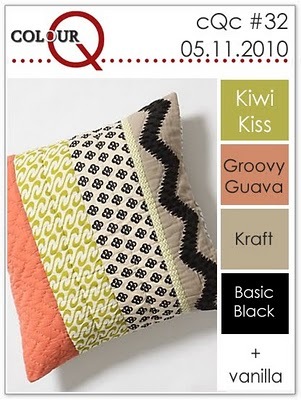 Thanks for playing along with us at the Colour Q! Gorgeous card. I love the background stamp and that beautiful peacock. 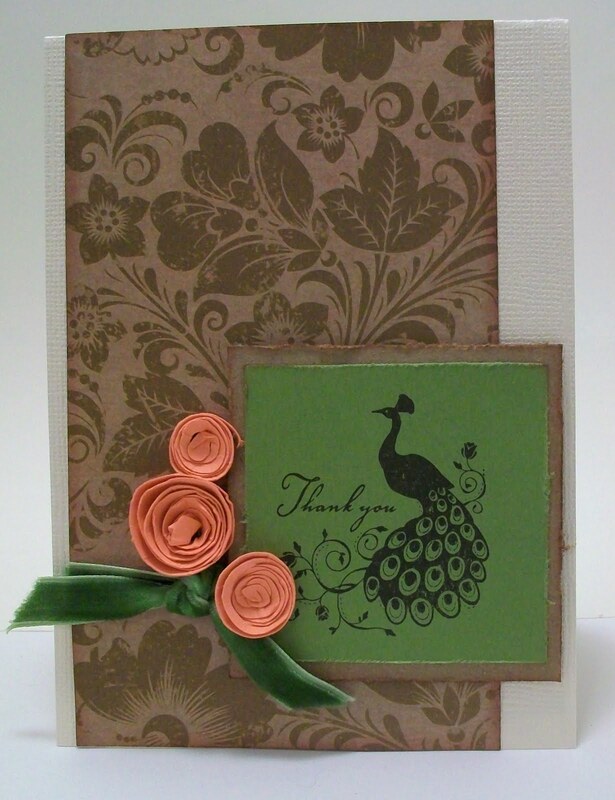 I am loving those card stock roses evreywhere too. Must give them a go. This is really gorgeous! Great job! Love what you did with that peacock stamp and the flowers are great!